More than any other time of the year, this is when I see families posing for photographers out around Houston. So what are some good backdrops for great pictures and holiday cards? 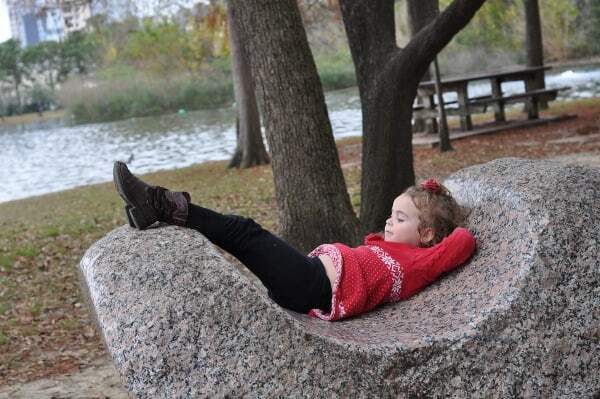 There are many many spots for great photos in Buffalo Bayou Park. You have trails, skyline and cool equipment and sculptures. From this fancy bridge, you have a great view of the skyline. Park at the Water Works building parking lot or on the street, for free. There is no parking on the bridge, but the walk is very short. 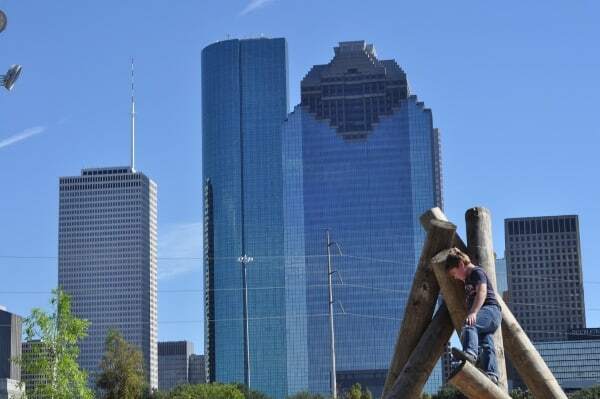 This nature playground has tree stumps, slides and climbing equipment… all right along the bayou and with a view of downtown. Park at Water Works building parking lot or on the street, for free. This park has an amazing view of downtown! 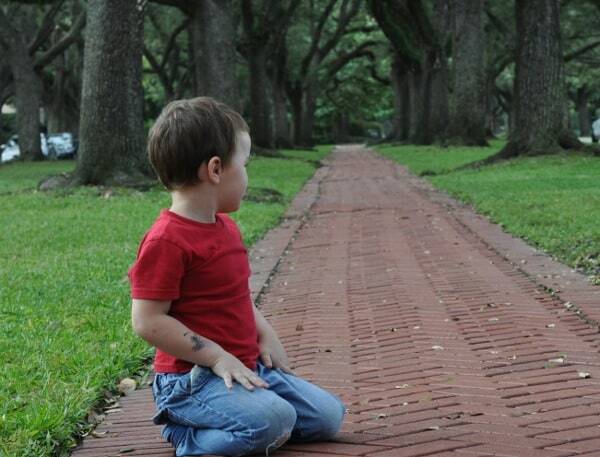 You can pose for photos away from the street… so it can be easier for parents with kids that like to run. 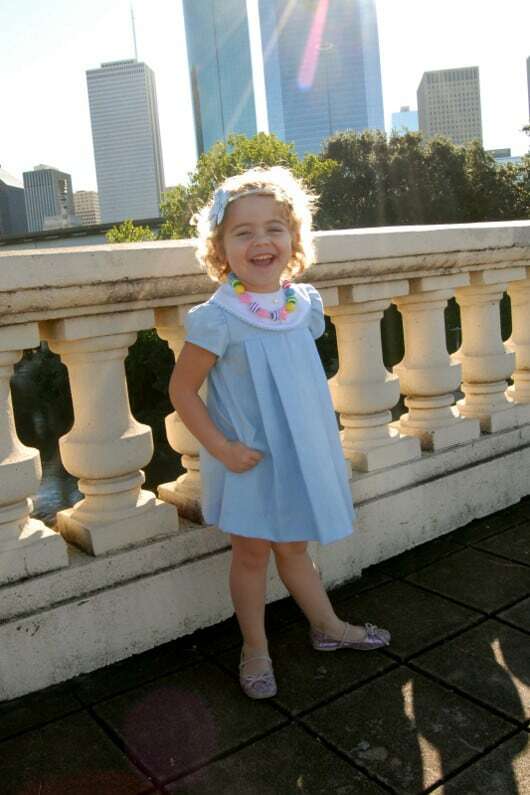 Park along Allen Parkway (in the newly added parking spots) for free. 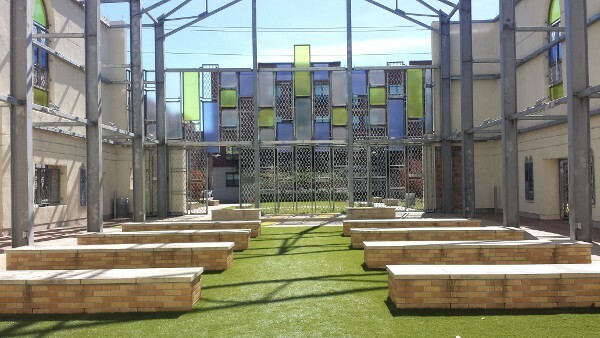 At the other side of Buffalo Bayou Park from the playground is the Theater District. 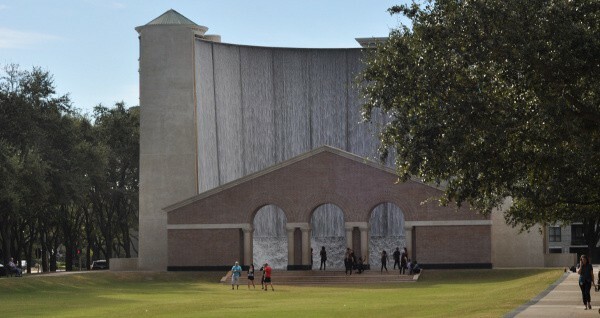 Behind the Wortham Theater, at the bayou, is this waterfall. Park in a paid garage or at metered street parking. 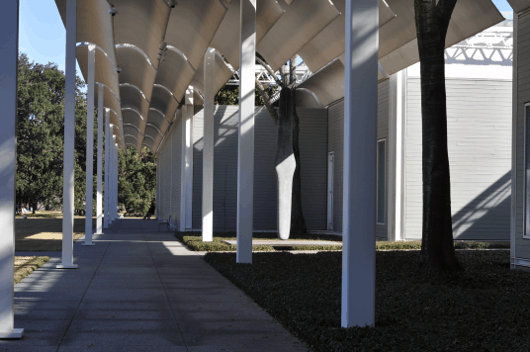 You will see a lot of families and photographers out at the Menil Collection Campus. 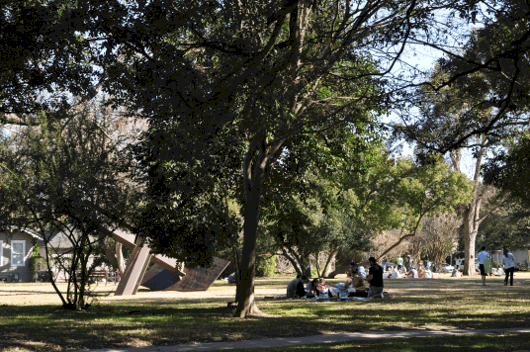 There are trees, sculptures and the distinctive gray buildings, benches and bungalows. Parking is free along the street or in the parking lots. 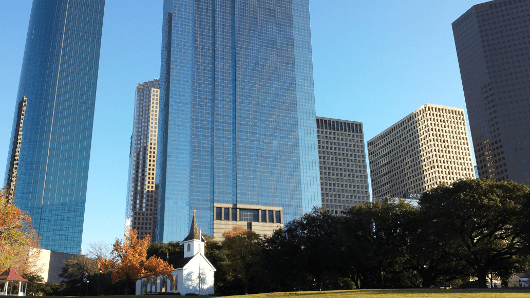 Take photos by the historic buildings and church… with the downtown skyline in the background. Metered parking is available along the street. 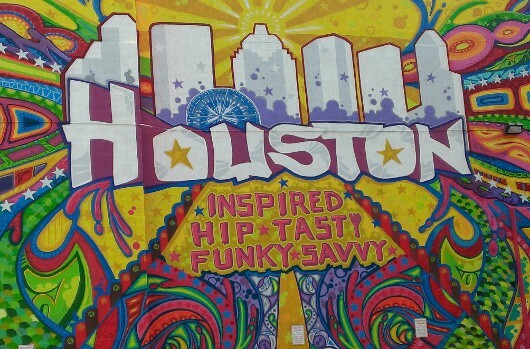 Houston is full of colorful walls! Find a MAP over at Wear Where Well. 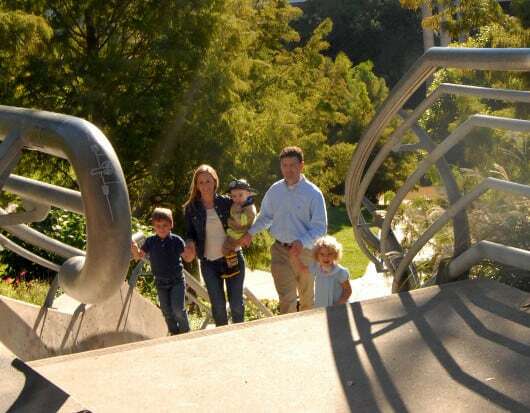 With trails, trees, bridges, trains and water features, this is another popular spot for family photos. You can park for free in the lots or pay for metered parking on the street. 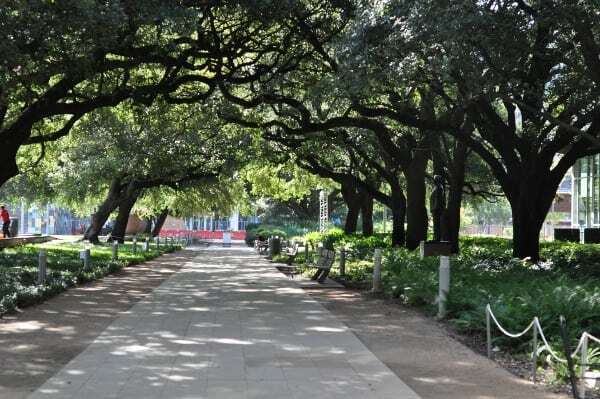 This Hermann Park trail has giant trees lining the path. There are good photo back drops right by the parking lot (near the health museum) and also by the driving range. 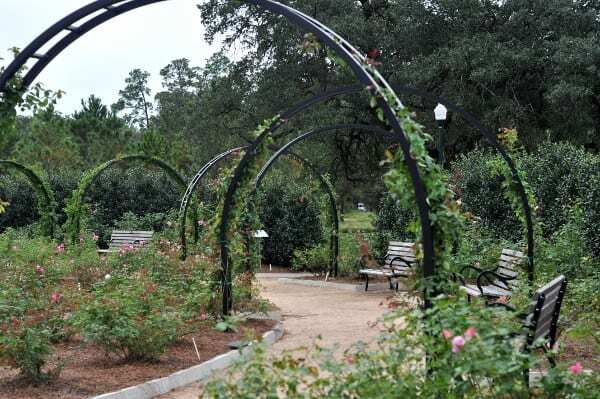 This Hermann Park beautiful garden is right by the Museum of Natural Science. There are flowers, arches, water and benches. The park is so big, you will find many more spots for good photos. The zoo and train station part of the park has a cool bridge and lake… but can get very busy. The rest of the park has trees and benches and water that will work well and be less busy. Big trees, colorful block walls and lots of sunshine make this another great spot for photos. Parking is paid in lots and metered on the street. Early in the morning, before for field trips, playdates and lunch-breakers fill the park, you can get the promenade to yourself. 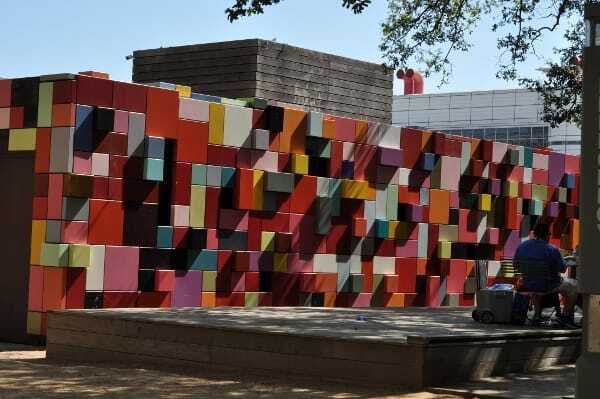 Take a photo by the famous block walls or the other art around the park! 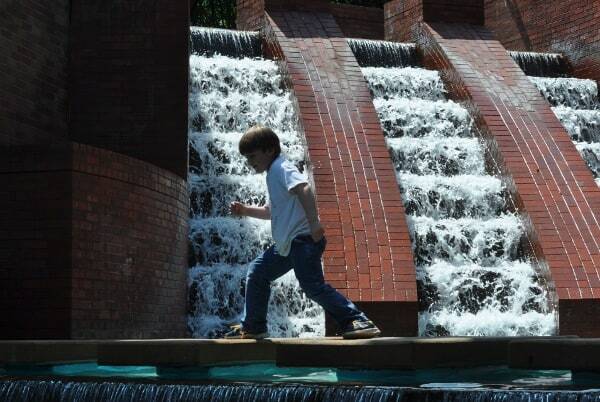 In the Galleria, take pictures by the giant wall of water or by the giant trees the line the park. 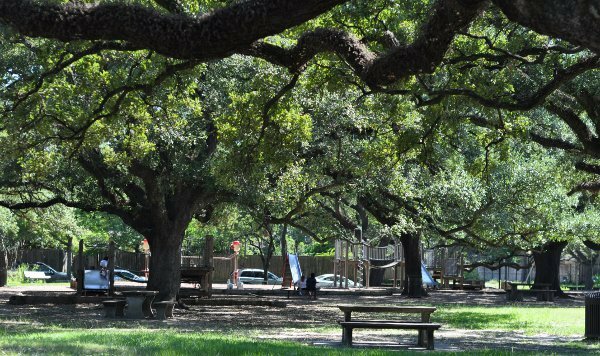 In the Museum District, giant oak trees line the street. On North and South Boulevard, west of Menil, the median has a cool brick sidewalk and even more trees than the rest of the neighborhood. Parking is free along the street. Want more big trees? Try this museum district playground. Parking is free along the street. 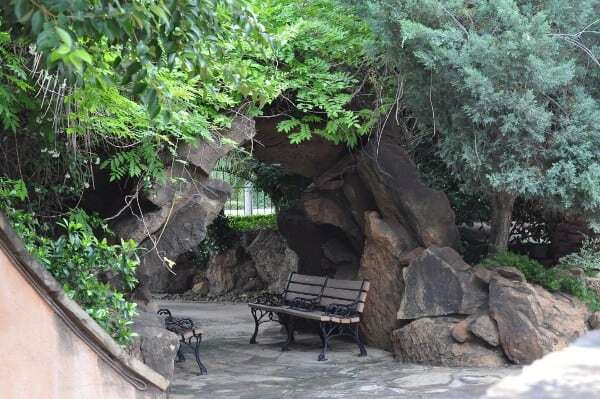 This park is the most surprising thing in downtown Houston. 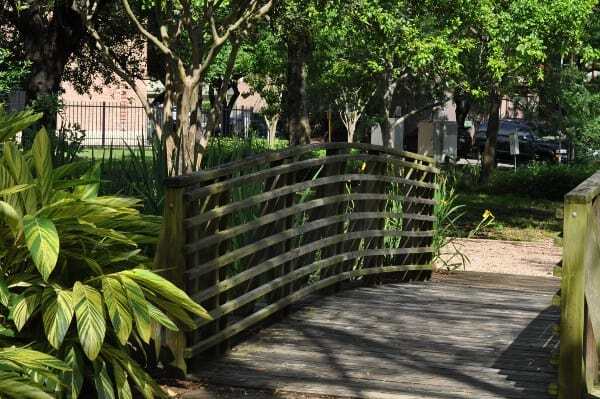 Paths, plants and covered walkways. Just look at this place. It’s a city park in an old burned down church. 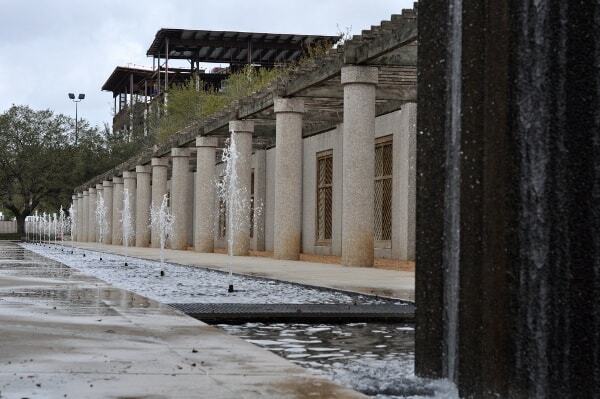 Water, rocks, pergolas and paths. Parking is free in the library parking lot. 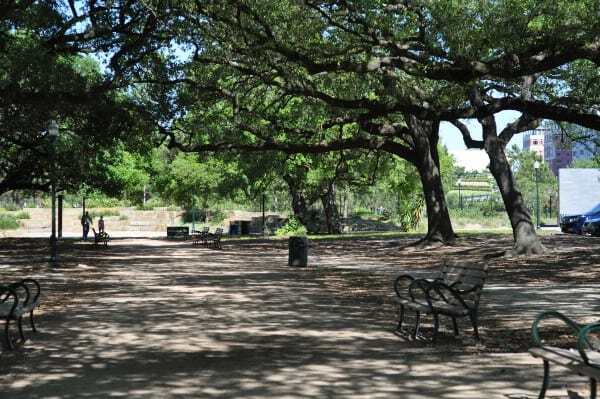 This park near the Museum of Fine Arts and Hermann Park is small… but has trees, bridges and water that would be good for pictures. 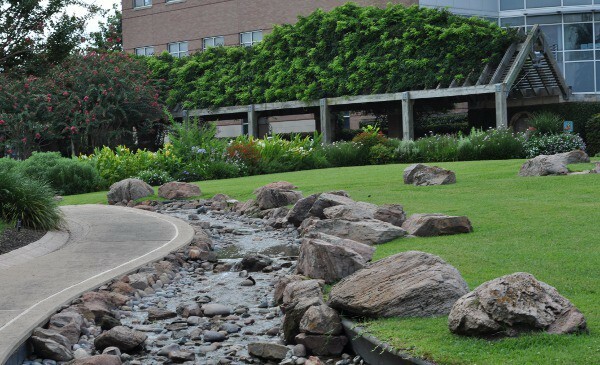 This Medical Center park is popular with photographers. The trick is parking. There is no attached parking so you need to find a paid garage along the street. If you are up for taking the train, it is close to the tracks. Always use natural light. Go outside or be close to a window. And if you must be inside, turn off overhead lights and use light bouncing off the ceiling. Step away from the wall or backdrop. This adds some depth to the picture. Take a look at what is in the frame. Try to cut out cars, trash cans, etc. 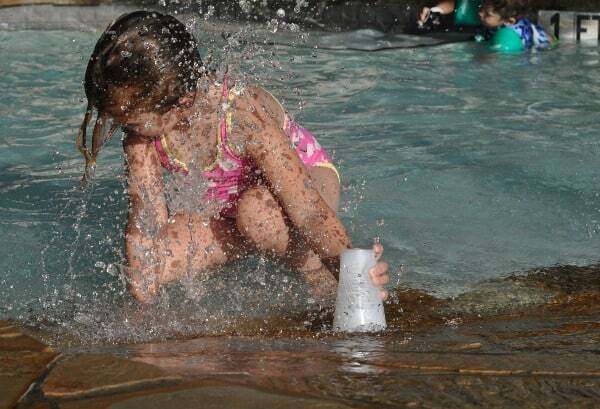 Take action shots. Get the kids to laugh or play so you don’t just get cheesy grins. 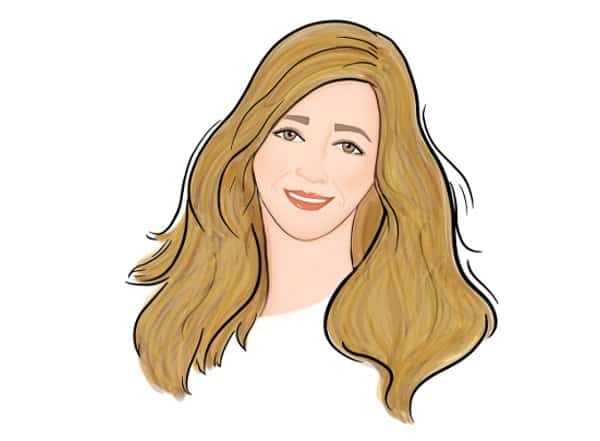 See THESE tips from Nhem Photo. 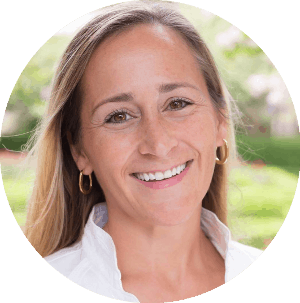 Look at how to add excitement to the photos from Queen B Photography. Notice how her still photos look like movies? Look how ABBA Color Photography carefully lays out every piece of the background and has thought through the session before quickly snapping photos of wiggly kids. 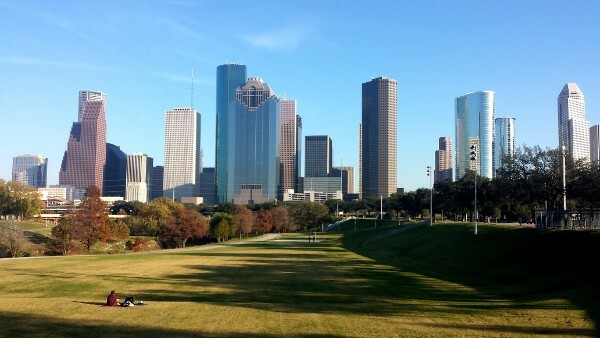 Do you have more ideas for good photos and for good Houston backdrops? Let us know! Thanks so much for mentioning our mural guide!